Priyanka Gandhi, EVMs and communal campaigning came in for debate, Sunday evening but it is also the evening for interviews and here, CNN News 18 stole the show. Editor-in-chief, Rahul Joshi interviewed former Bihar chief Rabri Devi along with her son, former deputy CM Tejashwi Yadav. Rabri Devi said her husband and former CM, Lalu Prasad Yadav, currently in jail, was sorely missed in the campaign: “People like what he says,” she added. Tejashwi claimed he was prevented from meeting his father, even though he was seriously ill—and despite repeated requests. Asked by Joshi if the elections were about “nationalism”, Tejashwi replied that real issues, like agrarian distress, have been ignored by BJP. 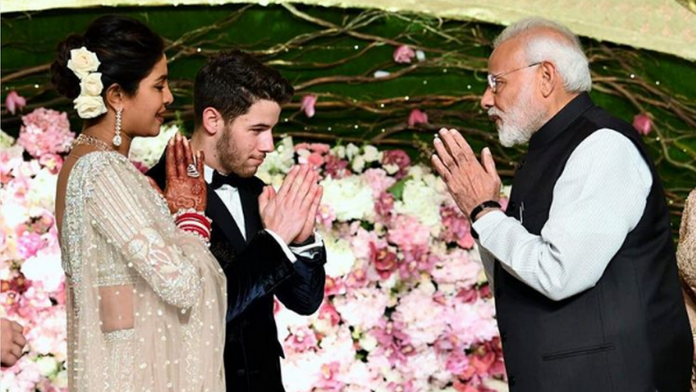 “Modi ji does not have time to meet farmers but Modi ji has time to attend Priyanka Chopra’s wedding reception,” he commented, tartly. On the likely number of seats RJD would win in Bihar, Tejashwi was confident of a sweep. In that case, he wondered, what would his ‘Paltu Chacha’ (chief minister Nitish Kumar) do after the elections- would he change sides again? Zee News Anchor Prashant Kamra wondered if “Kashi” would become “Kurukshetra” in 2019 general assembly elections.Rumours say Congress’s Priyanka Gandhi Vadra may contest against PM Narendra Modi from Varanasi. Kamra added that sources claimed Priyanka might even be the mahagatbandhan candidate from Varanasi. Samajwadi Party spokesperson Vivek Silas was happy if Priyanka stood from Varanasi but did not confirm the rumour that she would be the mahagathbandhan candidate. India Today Anchor Rahul Kanwal raised the issue of safety level of EVMs, following complaints of “tampering” by opposition parties. Both journalist Ajit K. Jha and Congress spokesperson Muhammad Khan believed EVMs are vulnerable. “VVPATs should be increased, there should be paper trail and more transparency,” declared Jha. BJP spokesperson Aman Sinha was satisfied with the EVMs. “We have not cried foul over EVMs when we win or lose elections,” he said. In “#2019DirtyCampaign”, anchor Republic TV Arnab Goswami blamed the ruling BJP and the opposition for ignoring real issues in the elections for divisive narratives. All India Majlis-e-Ittehad-ul-Muslimeen (AIMIM) MLA Waris Pathan claimed BJP was at fault: “BJP has targeted Muslims,” he said. The mainstream newspapers go with different leads, this morning. The Hindu and Hindustan Times begin with the opposition’s demand for a paper trail on at least 50 per cent of EVM votes. The Hindu writes that the leaders said they had raised the issue with the Election Commission many times, but ED had not taken the matter “seriously”, thereby cementing their decision to move the Supreme Court. The parties include the Telugu Desam Party, Samajwadi Party, the Aam Aadmi Party, and “the Left parties, among others”, says Hindustan Times, adding that they are “ratcheting up criticism of electronic voting machines (EVM) just three days after polling began”. There’s some confusion on the number of parties making this claim — 21 says The Hindu, 23 says HT, 6 claims Times of India which devotes less than column space to the issue on page one: “The move comes a week after the SC asked the EC to count VVPAT slips in five EVMs in every assembly segment,” Times explains. The Times’s lead would surprise readers: “At ₹670cr, BSP has biggest bank balance among parties.” In “the expenditure report” submitted by Mayawati’s Bahujan Samaj Party (BSP) to Enforcement Directorate (ED) on 25 February, “(it) states that it has Rs 669 crore deposited in eight accounts in branches of public sector banks in the national capital region”, with an addition of Rs 95.54 lakh “cash in hand”. Samajwadi Party is next with Rs 471 crore, then Congress with Rs 196 crore. Surprisingly “BJP occupies the fifth position with a bank balance of Rs 82 crore”, the article continues, which “looks rather small considering that it is way ahead in mopping up contributions, including through electoral bonds”. A possible explanation? “The party has claimed to have spent Rs 758 crore — the largest expenditure by any party — of the Rs 1,027 crore it had raised in 2017-18,” writes Times. The Indian Express highlights Prime Minister Narendra Modi claim that “Islamabad’s nuclear threats had been blown to bits” at his rally in Kathua (Jammu and Kashmir). It adds that he said he didn’t bow before any such “dhamki” (“Pak hopes for talks post polls; PM says crushed its n-threats”). According to HT in “Modi: NC, PDP ruined 3 generations in Kashmir”, the PM “blamed two political families of Kashmir” — of National Conference leader Omar Abdullah and Peoples Democratic Party chief Mehbooba Mufti — for “ruining” three generations in the state and said he will not allow them to “divide the country”. The Express’s exclusive for the day is “Why EC frowned on DD’s coverage: BJP got 160 hrs in a month, Cong 80”, based on a report shared by DD News. “A senior source at the public broadcaster justified the above break-up on the ground that the BJP has a majority of the seats in the Lok Sabha…while the Congress is much smaller,” says the report. “EC’s guidelines for DD and AIR clearly state that the two public broadcasters should provide fair and balanced coverage of campaigning, plus speeches…and this balance need not be achieved in a single day or story but over a reasonable time, say one week,” explains Express. There’s range of comment this morning but away from politics are the crucial concerns about the economy. In “Low inflation adds to BJP’s political worries”, Hindustan Times says inflation, which has grown at its “slowest” since 2012-13 and is highlighted by the ruling Bharatiya Janata Party as “one of its biggest achievements” also tells another story. Food inflation at 0.7 per cent in 2018-19, “means food prices did not increase at all in the last one year”. Inflation growth for vegetables is “negative”. And “wholesale price inflation statistics suggests that the slump in farm prices last year was the worst in the last 18 years”. This means, “farm distress is a direct byproduct of low inflation”. HT concludes that while low inflation is good no government can afford to achieve growth and promote investment, by “putting a squeeze on farmers” incomes by keeping food prices “depressed”.